Sbun-Nga Textile Museum is regarded as the largest of its kind in Thailand. It was funded privately by a textile expert to preserve the Thai’s heritage in costume creation for the future generations. Why SBUN-NGA Textile Museum is special ? The Sbun Nga Textile Museum is only three years old but houses a vast collection of stunning northern Thai textiles. The extent of the collection is down to one man, Akarat Nakkabunlung who has been collecting for more than twenty years. More than a thousand rare and ancient textiles are displayed with old photographs, furniture and other accessories adding to the interest. Everything here is identified in English both for its type, location and age. What to explore at SBUN-NGA Textile Museum? The Sbun Nga Textile Museum contains part of the private collection of Khun Akadet Nakbunlung acquired over a period of 20 years. The collection comprises regional Thai textiles from Northern Thailand, Vietnam, Burma, Laos and China and contains over 1000 articles. 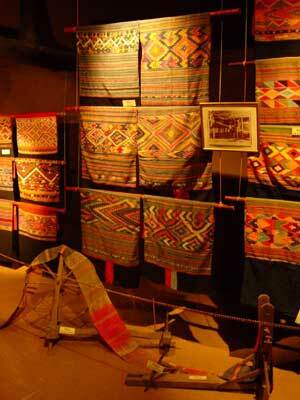 Sbun Nga Textile Museum has the largest collection of Ethnic textiles in Thailand and is displayed in 5 rooms. Each room has a short introduction in English explaining the textiles shown and there are also many informative labels also in English. Many of the displays include every day items to help bring them to life and there are lots of old photos showing the textiles being worn. One very interesting group of textiles are plain white cotton shirts worn by Lanna soldiers going into battle. These cotton shirts are printed in black ink with mystical symbols and spells to give the soldiers strength and protection. These designs are similar to Sak Yant tattoos which serve the same purpose.